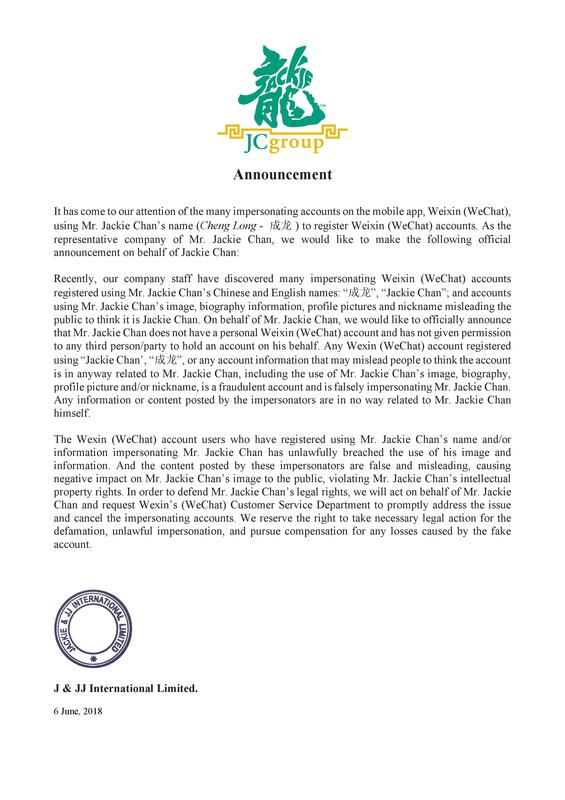 Recently, our company staff have discovered many impersonating Weixin (WeChat) accounts registered using Mr. Jackie Chan’s Chinese and English names: “成龙”, “Jackie Chan”; and accounts using Mr. Jackie Chan’s image, biography information, profile pictures and nickname misleading the public to think it is Jackie Chan. On behalf of Mr. Jackie Chan, we would like to officially announce that Mr. Jackie Chan does not have a personal Weixin (WeChat) account and has not given permission to any third person/party to hold an account on his behalf. Any Wexin (WeChat) account registered using “Jackie Chan’, “成龙”, or any account information that may mislead people to think the account is in anyway related to Mr. Jackie Chan, including the use of Mr. Jackie Chan’s image, biography, profile picture and/or nickname, is a fraudulent account and is falsely impersonating Mr. Jackie Chan. Any information or content posted by the impersonators are in no way related to Mr. Jackie Chan himself. The Wexin (WeChat) account users who have registered using Mr. Jackie Chan’s name and/or information impersonating Mr. Jackie Chan has unlawfully breached the use of his image and information. And the content posted by these impersonators are false and misleading, causing negative impact on Mr. Jackie Chan’s image to the public, violating Mr. Jackie Chan’s intellectual property rights. 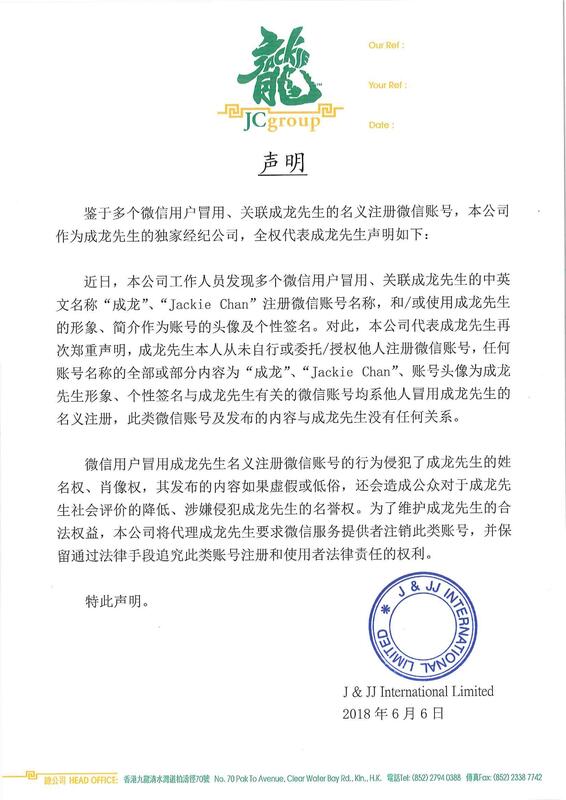 In order to defend Mr. Jackie Chan’s legal rights, we will act on behalf of Mr. Jackie Chan and request Wexin’s (WeChat) Customer Service Department to promptly address the issue and cancel the impersonating accounts. We reserve the right to take necessary legal action for the defamation, unlawful impersonation, and pursue compensation for any losses caused by the fake account. J & JJ International Limited.